When it’s time to “unplug” and unwind, your master bedroom is a sanctuary and place to escape. Flowing from the master bedroom, your master bath should have the same relaxing effect. You can create a magnificent retreat in your master bath whether your budget allows for a splurge to create a spa-like environment or not. With a variety of options, you can choose the best one to give you an elegant and peaceful atmosphere. “Light” or white surfaces have become a popular trend for the master bath. If that sounds surprising to you, be assured, there’s a reason so many have gravitated to white. 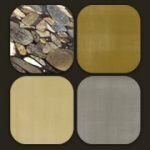 You can choose from options in natural stone such as marble, granite, quartzite or even engineered quartz products in a variety of price points to achieve the look you want. Adding a few other details to the master bath, such as breaking up countertop sections, will add dimension to the space. We do this by changing the depth of cabinetry followed by the countertop. 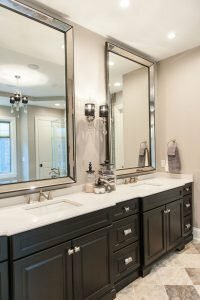 Another way to connect the space in the master bath is by using the same countertop material throughout. “The tub and shower area provide a great opportunity to create consistency and flow,” Kroger says. This will also simplify the selection process as the space is being created. Start planning your luxurious, spa-like master bath retreat today. Contact Stone Artisans at 317-874-8955 for a free estimate. Whether your doing a remodel or new build, they can help you. Visit them online at stone-artisans.com to get some excellent ideas by browsing some of the spectacular projects they’ve done.